In July 2017 Samansco was deployed on behalf of OXFAM to install piped water infrastructure in four communities located in Makuzeze, Ngulubeni, Ratanyana and Marinoha. Matabeleland province in Zimbabwe is characterised by chronic drought conditions and perennial water shortages. As part of their commitment to rural development, Oxfam required a competent contractor to install a solar powered water pumping system in Ratanyana. Members of the Ratanyana community had spent years sustaining their water provisions by collecting water from a single bush pump. Not only was this unsustainable, but it also put members of the community at risk of contracting diseases from unsafe drinking water. Samansco installed a new piped water supply network, as well as a solar powered Lorentz water pumping system. The new installed pump provides the community with upwards of 50,000litres of water per day. This new water supply has had an invaluably positive impact on the outlook of this community. 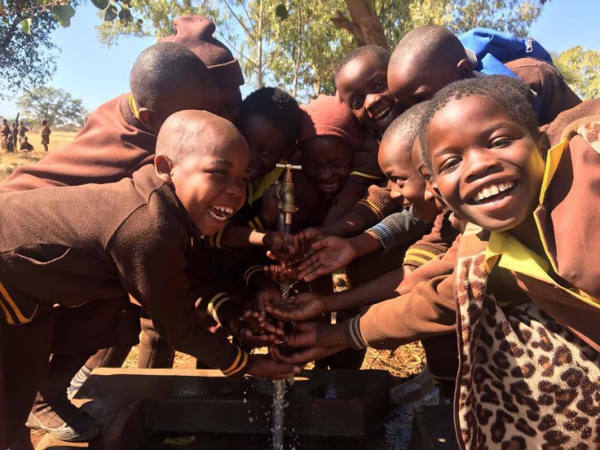 The highlight of this project was the anticipation and jovial responses we received from the children of Ratanyana primary school, as they opened the tap located by their school for the first time. The Samansco team takes pride in being part of a life changing project that has impacted young lives in such a positive manner. The children of the Ratanyana community were the embodiment of youthful exuberance. Meeting them in and around the community during the implementation of our project, became a highlight for our team, which was working tirelessly to deliver solutions for 4 communities at the same time.